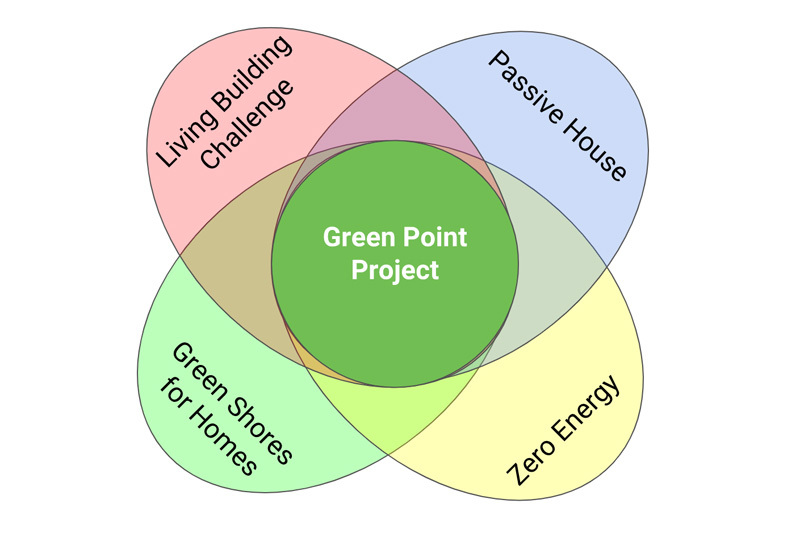 Welcome to The Green Point Project. A pioneering project aiming for Living Building Challenge, Zero Energy, Passive House, and Green Shores for Homes certification. It's the project's aim to "rejuvenate the ecosystem; build in an affordable and sustainable way; dwell in a healthy, living building and preserve our unique history." Larsen Trusses are similar to I-Joists, and match our Smart Enclosure details closely. The reason for the this swap was a good one: they are using reclaimed wood for much of the project, opting to build the Trusses on-site with what would have been scrap rather than building new I-Joists made of virgin material. Mark Bernhardt of Bernhardt Contracting walks us through the detailing of the window installation in this well-made video produced by Arcas Media. All products are supplied by 475. After walking through the step-by-step process for ensuring an airtight window process, Mark shared a few things he believes set Pro Clima products apart from the rest. Mark says that when working with these membranes, a certain amount of stiffness is essential as it holds a staple better and makes for any easy installation process. Additionally, he states that Pro Clima tape has great adhesion right away and that the tape is very tolerant for the various “non-perfect” conditions that come along with being on a construction site. In our I-Joist details you’ll find we showcase two methods of window detailing in our Tier 1 & Tier 2 of the Smart Enclosure System, which are along the same lines. And to follow along on Instagram find @bernhardt_contracting, @thegreenpointproject, and of course us: @foursevenfivedotcom.